On a rainy day in Chennai, when I was on my way home from college, I decided to stop for a few minutes since the rain was a killer. I searched high and low for a place with no trees around to park the car, as I had seen a few trees fallen on top of cars. After searching for a bit in Anna Nagar, I found such an open spot opposite to Titan watch showroom. As I parked the vehicle, I saw this shop which looked more like a Fag Shop. But it had a name board which read: R.K. Beeda Center. Since it was raining, I decided to head to the shop and have a hot Chai. But to my bad luck, the power was down in that area, so his Chai vending machine was down too. Just as I wondered what to do next, I saw rack of Puffs. I asked the person on the other side of the counter to get me a puff. He asked me, which one did I want, the Plain Puff or Vegetable Puff or the Cheese Puff? As he said Cheese Puff, it started ringing some bells in my head. So I asked him for a Cheese Puff and I waited as a Passive Smoker, as people around me were burning their money away. After a quick cut here and a quick slash there on the Puff, I was given my Puff. One bite of it and I realized that this was more like a Bhel Puri topped with Cheese put inside a puff. 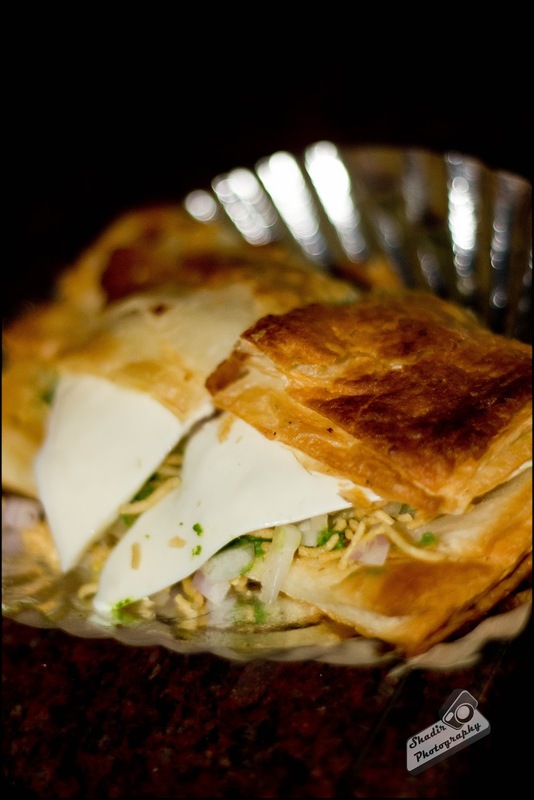 I felt it was very innovative use of puffed rice and sev in a puff. Coming to think of it, its a Puff inside a Puff :P. And I just loved it. The Cheese Puff is definitely worth a try if you do not mind walking up to a shop filled with people puffing smoke. Priced at Rs 10/- for a puff its well worth a try. Ambiance - If a group of people smoking can be counted as Ambiance then you have a very good one.